Dilanthi Ranaweera has forged a path of public service from Washington, DC to the rural farms of Myanmar and Kenya. As part of the field operations team at One Acre Fund, a US-based NGO, the School of International Service (SIS) alumna helps smallholder farmers develop a better quality of life. Most of the world’s poor live in rural areas, says Dilanthi, SIS/MA ’15, like the rice fields of Myanmar. The rural, smallholder farmer does not have access to certain resources, like money for education or health care, and lives in perpetual debt. His or her entire livelihood depends on agriculture. One Acre Fund works with these farmers to increase their harvest and household profits. By removing the income barriers standing in their way, Dilanthi strives to increase their access to opportunity – whether that be better technology, health care, or simply the chance to take a vacation. 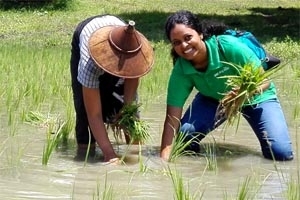 “Improving the farmers’ crops and yields and, as a result, their whole household income, not only improves his or her family’s livelihood and well-being, it also provides food for the community and the world,” says Dilanthi. One Acre Fund first started in Kenya in 2006 and has since grown to serve over 600,000 smallholder farmers. Dilanthi was a field operations lead for the organization’s first-ever pilot program in East Asia, where she recruited, trained, and assisted farmers directly in the field. After the Myanmar pilot shut down in May, Dilanthi joined the organization’s Kenya program. Dilanthi wanted to continue working for One Acre Fund because she believes in the organization’s mission, and she chose to remain in the field operations department because it maintains the most direct contact with farmers. Like One Acre Fund, Dilanthi believes the best way to serve her clients is to live and work in the same area as them. She can see the farmers’ fields from her office in Kenya, and while in Myanmar she lived 30 minutes away from the farms and visited them often to understand any challenges her staff faced firsthand. In Kenya, Dilanthi works on the field staff management team that recruits, trains, and manages the performance of the field team, which numbers more than 2,500. Instead of interacting directly with the farmers, she now trains staff from local communities to perform that role, empowering them to be the changemakers. Dilanthi credits SIS, a top-10 school of international affairs, and the International Development master’s program, one of the best established in the world, for planting the seeds of her success. She was first introduced to development work in her home country of Sri Lanka, which experienced a civil war from 1983 to 2009. Relief work was inescapable in the country’s formerly war-torn rural areas. It was while working in those areas that Dilanthi realized she wanted to focus on income generation for rural, low-income populations. She chose AU for graduate school because of the curriculum, which balanced theory and practice, the prestige of the SIS, and the ability to cater her degree to her specific interests. What stands out most about her AU experience were the connections she made – the people she got to know, learn from, and grow with. Many of her internships came to her through alumni connections, and she learned about her current role through a classmate. Learn more about AU’s graduate program in International Development and request information.